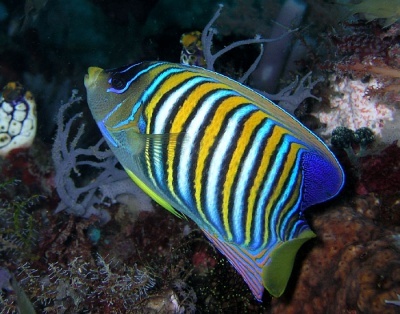 The Ornate Angelfish (also called Bellus Angelfish) is a moderately easy fish to keep, but expensive to buy. It is found mostly in the Pacific Ocean, with some in the Indian Ocean. Males grow up to 7 in., but the females are smaller. Dwarf angels can be aggressive with the Swallowtail. The minimum size tank is 70 gal. for a single female, 106 gal. for a single male. Pairs need at least 120 gal. tank. This fish can be safely kept in a reef tank.